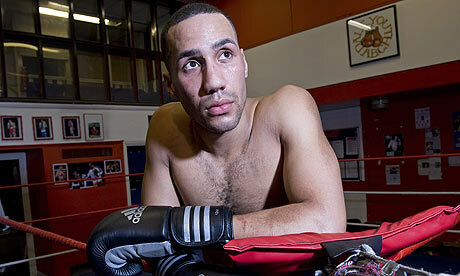 It wasn’t all doom and gloom for DeGale. He remains quick and slick with some exceptionally nasty body work and cute counter uppercuts. In the moments where he does put it all together he looks spectacular but in much the same way as in previous bouts those moments are nowhere near frequent enough. Far too often he appears overconfident, his defence open and his workrate far too low. That said, one does have to praise his fighters heart; after the two poor rounds he had (the second and the seventh) he came back strongly, taking over in the second and rocking Khatchikian in the eighth. More then that despite all the posing and preening he still stuck to some basics, landing hurtful shots to the body at every opportunity. In the end, DeGale’s class showed through. Outside of the aforementioned second and seventh rounds Khatchikian rarely landed a clean punch on DeGale and those body shots added up. By the 11th Khatchikian was clearly ragged and a series of body shots brought him to the mat. He recovered, only to be dropped again by another body shot and there were no objections when the referee waved it off. It wasn’t the showcase performance DeGale promised and that we wanted but it was a solid one. He rarely retreated to the ropes and invited opponents on in the way he had in past bouts and he looked that little bit sharper and little bit more consistent than he had before. The way his defence can be parted and his tendecy to stop punching when pressured are a worry but for arguably the first time since signing to face George Groves he can take more positives than negatives from a bout. Going into the bout the assumption was that if DeGale got past Khatchikian he’d face Badou Jack in a final eliminator before facing Sakio Bika for the world title. Jack had a rather different plan however, getting stopped in a round by the unheralded Derek Edwards in what was meant to be his own showcase bout. That obviously takes him out of contention for now and it appears he may well be installed as Bika’s mandatory and thus almost certainly get the bout. It’s an intruiging contest; Bika’s looked awful in his recent bouts. Always wild and rough he’s become virtually a self-parody of himself and his style with looping punches, clinching and fouls. If he performs like he could you’d expect DeGale to win comfortably. But if he performs like he did in the second or seventh round you’d think Bika… who for all his sins is tough and relentless… would eat him up on the inside. In the televised support bout to DeGale, British domestic fixture Lee Haskins took on unheralded “prospect” (and I use the term loosely) Luke Wilton. Haskins has been in or around the top of the domestic scene since 2007 but he’s never quite been able to make the step up to international class and at 30 this likely represents his last run in boxing. Wilton had lost his only significant fight to date (a wide decision to undefeated British and Commonwealth champion Kevin Satchell) and despite a pretty looking 15-3 record he hadn’t beaten anyone of note and one of his losses was to a 10-86-3 journeyman. Haskins looked wonderful in this bout, although we do have to make some allowance for the fact Wilton was such an underwhelming opponent. Haskins played matador, leading the hard charging Wilton into uppercuts and cuts, simply too powerful and too strong for the naturally smaller man. The end came in the second, Haskins countering with an uppercut from the outside which wobbled Wilton and then finishing him with a follow up flurry. The Channel 5 announcers were very optimistically talking about a world title bout for Haskins. I think that’s highly unlikely but a win here… and a win in a pretty exciting fashion… likely gets him a bout against one of the better domestic names. As for Wilton I suspect he’s back to beating scrubs and losing to anyone with a pulse. This entry was posted in Analysis, Boxing, British Boxing and tagged Analysis, Boxing, British Boxing, Gevorg Khatchikian, James DeGale, Lee Haskins, Luke Wilton by consortium11. Bookmark the permalink.